Do You Really Need a Paint Sprayer? Ever painted a house? Then you know just how fun it is to wield a roller or brush–not. Brushes, good for small areas, are time-intensive. Paint rollers lay down a thick coat, but it is difficult to apply the paint evenly. The natural solution seems to be a paint sprayer. What can be easier than pulling a trigger and letting the paint fly? While there is some grounding in this fantasy, it does come with some significant drawbacks. Prep Is an Absolute Killer: The prep work for using paint sprayers (masking tape, tarps, etc.) is brutal. Literally, every single thing that will not be painted must be covered. There is no "wiggle room" like you might have with rollers or brushes. Cheap Sprayers Make Your Life Harder: Paint sprayers on the cheaper end of the scale can often be practically worthless. Contrast this with other remodeling tools, such as lower-end miter saws or cordless drills, which are not exactly miraculous but do the job sufficiently enough to warrant the purchase. But dirt-cheap paint sprayers are usually more trouble than they are worth. Not Worth It For Small Jobs: Paint sprayers are a terrible choice for small jobs. You may spend more time with prep work and clean-up than you will with the actual painting. Large Spaces Easier: The best thing about paint sprayers is that they allow you to cover wide swaths with less effort than you would with paint rollers or brushes. Great For Rough Textures: Sprayers allow you to override surface imperfections such as bumps, gaps, cracks, and other things that often cause problems for paint rollers or brushes. 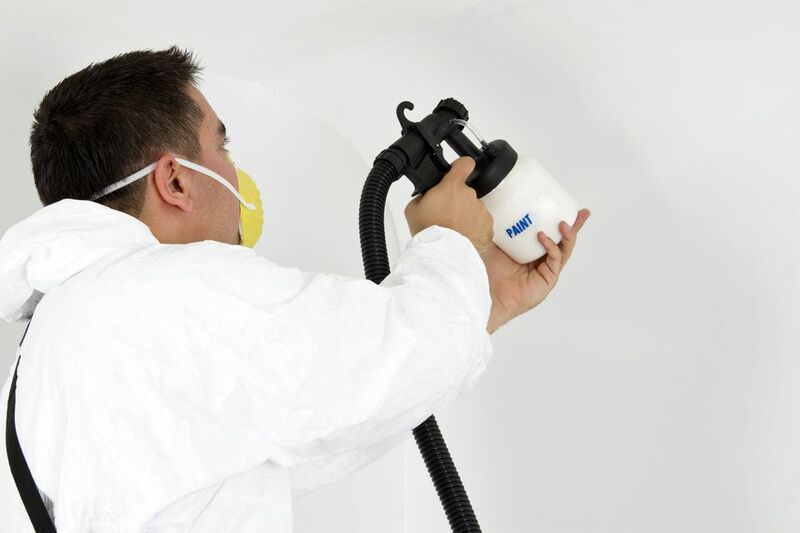 An Even Coat: With sprayers, you can achieve a more even coat. Even though you still need to be aware of overlapping, as you would with paint rollers, it is far less of a factor when you are dealing with paint sprayers. Made For Exteriors: Because of the mist and potential for overspray, paint sprayers are a tough sell for interior painting. On the other hand, paint sprayers are almost made for exterior painting: few problems with overspray, ability to override the inevitable imperfections found on exterior siding, and the ability to cover wide swaths in one motion. Cup-style sprayers are electrically operated and consist of a gun that rests on top of a reservoir holding a small amount of paint, usually one quart. No Compressor: You do not need a separate air compressor to push the paint out. This sprayer has its own compressor. All you need to do is plug it into any available electrical outlet. Price: The other great thing is the price, usually under $100. Lower-end models are even available in the $30 or $40 range. The downside of cup spray guns is that one quart gets depleted very fast. This means frequent infusions of more paint–a process which gets tedious after a while. Also, this type is sprayer does not work very well the moment you try to angle it up or down. Just like any other type of sprayer (for example, a bottle of Windex), the level is best. Finally, it is not optimal for anything more than a wall or two, and often they lay down an uneven coat of paint and have a tendency to “choke” on the paint that they are trying to draw up.